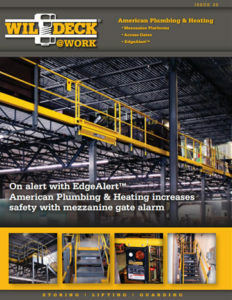 American Plumbing & Heating On alert with EdgeAlert™ American Plumbing & Heating increases safety with mezzanine gate alarm. In a thriving economy, growth is as welcome as it is daunting. When it’s time to expand your facilities, there are only a few options. American Plumbing & Heating knows this challenge well. American Plumbing & Heating, headquartered in Norwell, Massachusetts, is no stranger to the high demand of both commercial and residential plumbing fabrication. Having served the New England region for over 31 years, president and founder Joe Clancy has built a reputation for effectiveness and honesty. Through supporting the growth of major industries with high-quality plumbing and fire protection systems, American Plumbing & Heating has grown exponentially over the years and is now one of the largest plumbing and mechanical firms in New England. Because of this, American Plumbing & Heating found themselves running out of room in their warehouse. After careful consideration, they decided against building a new addition to their warehouse because of the disruption to their workflow and the amount of time an addition would take to build. 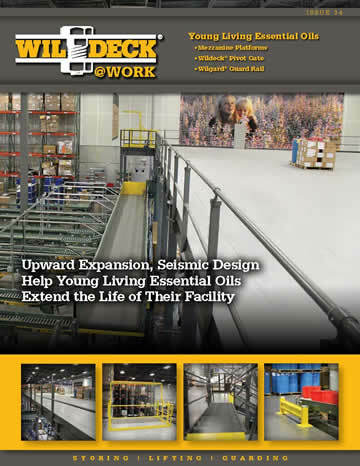 Instead, they chose to go with a less disruptive, and quicker-to-implement mezzanine from Wildeck. “We were thinking of putting an addition on the building, but decided to do the mezzanine. It’s a great space saver, and a lot less costly,” Clancy explained. 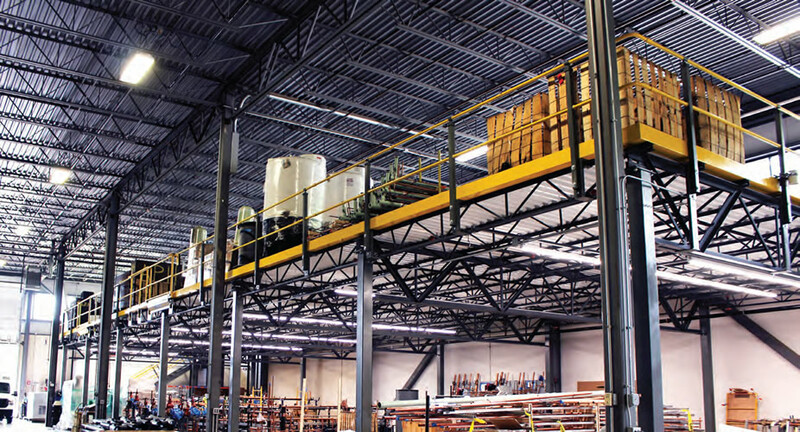 Before moving to its current facility, American Plumbing had previous experience with the benefits of installing a mezzanine platform into an existing space. But when the new Wildeck mezzanine was installed, Clancy couldn’t believe the difference in the quality and craftsmanship it offered. 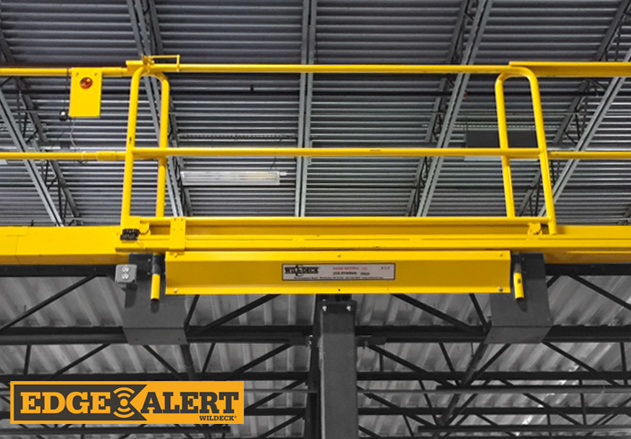 The most important factor in their decision to add a mezzanine work platform was the non-disruptive installation guarantee that came with it. 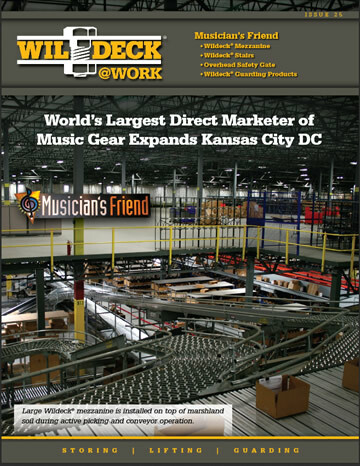 Having considered three different mezzanine installation contractors, Clancy was most impressed by the time and effort taken by Stewart Jastrow of Warehouse Structures, and Paul Allen of Abington, Massachusetts-based All Tech Materials Handling. Because of their diligence and detailed specification process, Clancy felt confident that they had the right proposal, the right mezzanine, and the best understanding of exactly what American Plumbing needed. “The thing that really impressed us was that Stew and Paul were so thorough with their measurements. They spent four to five hours measuring the space. We knew they were serious about it, and that gave us the most confidence,” Clancy said. The deciding factor to go with All Tech Materials Handling’s bid wasn’t just about the engineering they delivered, but was driven by their confidence in the quality of their product. Clancy was less concerned about cost savings and agreed that it was far more important to find contractors that represented American Plumbing & Heating’s own commitment to quality and willingness to stand behind a product. The final mezzanine measured 126’ x 34’ (4,284 sq. ft.). 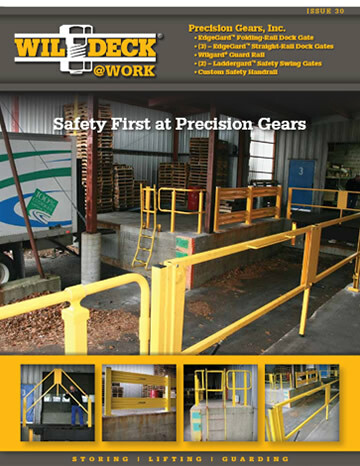 It featured two of Wildeck’s sliding access gates paired with their EdgeAlert™ Open Gate Alarm. American Plumbing & Heating is also the first company to take advantage of the EdgeAlert™— an audible alarm with flashing LED lights that instantly alerts operators of an open gate. 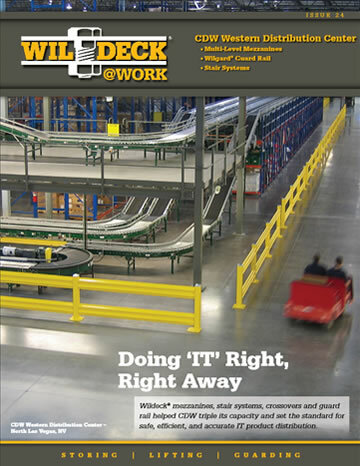 All Tech worked closely with Wildeck to design the mezzanine work platform to fit American Plumbing’s exact measurements. The installation went quickly and efficiently without disruption, as Wildeck’s pre-engineered parts don’t need any cutting or welding. Following the week-long installation process, the mezzanine work platform has performed well, freeing up floor space that had been previously taken up by storage needs. Having utilized the unused vertical space, American Plumbing’s 30,000 square feet of production space has increased to 34,284 square feet. Following the installation, Clancy and everyone else working in the facility couldn’t be happier with the final product.